I'm in the midsts of some new calculations right now as well as writing up a paper I've been working on for a few months, so no detailed blogging today. I did want to quickly add a little self-deprecating self-promotion if that isn't a complete oxymoron. Having appeared on TV here in front of 200 million (I still haven't seen the broadcast, though that's probably a good thing) and now being the voice to unknown thousands or possibly millions of school kids wishing to learn British English I felt that it was about time to make an impact in print. 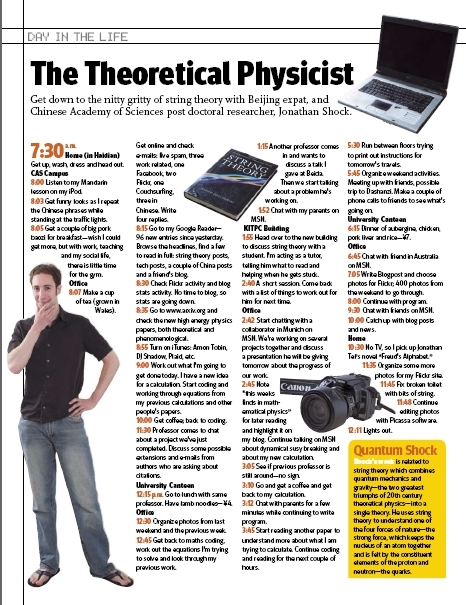 Well, actually I didn't decide, but I was contacted by the editors of 'Beijing city weekender', firstly in relation to my photos and then once they found out I was a scientist, purely in relation to my life here. BCW is a free biweekly publication, mostly for the English speaking expat community. Every issue they have a 'Day in the life of' article, where they see what people in various professions get up to in a normal working day. They hadn't had a scientist in before so asked if I was interested. This would involve me writing about an average day and coming in for a photo shoot. The writing was fine, the photo shoot was very strange. The editor, a photographer and his assistant and I stood in the photo studio. I took a look around the place and eyed up the cameras. They also have a sister publication all about cooking and so I took a sneak peek in the well fitted-out kitchen where they create the dishes to photograph. I go between bouts of thinking myself reasonably confident and bouts of returning to the fact that I'm a gangly guy who was always pretty nervous at school. The call to 'make some poses' didn't help and I found myself standing there making perhaps the most unnatural poses they'd ever seen. They managed not to laugh and continued to shoot as I stood there feeling rather bewildered. Well, they got their shots and then took some snaps of the three things from my day I had brought along: my laptop, a copy of Polchinski and my camera. Are you ashamed of your beardage Biscuit? You appear to me concealing it and smirking. Some beard-related in-joke perhaps? A facial farce. Hairy hilarity! Whiskery whimsy? I'll stop now. Having been mistaken for a man ten years my senior when sporting said beard I thought it wise to experiment with a smoother complexion for a time , at least while the temperature is usually in the 30s. I have to admit that seeing your impressive beard now I'm stumped to know what was going on in Prague. Or is it to take attention away from what's on your feet. As you might imagine, I wasn't going to mention that.